When working with your site in BoldGrid you will eventually decide you do not need one or more pages. Here we demonstrate how to remove pages from your site as well as restoring any you may have removed by mistake. Log into your site's admin dashboard. 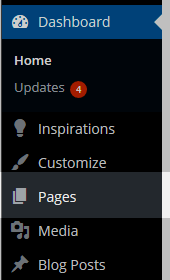 Using the left-hand side menu click on the Pages option. Now look to the right hand panel and locate the page you want to remove. Hover above the page and you will see a small menu of options appear underneath. Click on the Trash option to remove the page from your site. Notice the list of pages in the right hand panel all have a checkbox next to them. Click on the checkbox for all pages you want to remove. 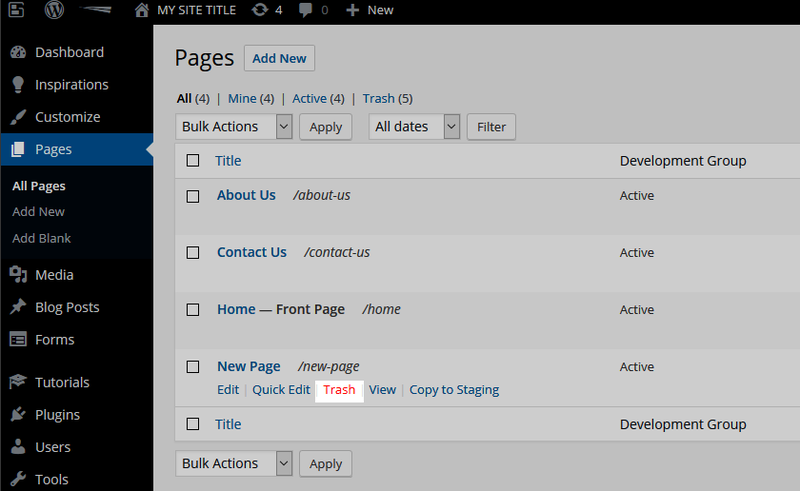 After selecting the pages you want to remove, click on the dropdown named Bulk Actions and select Move to Trash. To trash the pages, click on the Apply button. All selected pages will be removed from your site. Now look to the right hand panel and click on the Trash link that is located at the top of the page list. This displays the list of all the pages that are in the Trash. Hover over the page you wish to add back to your site and click on Restore. Just like sending pages to the Trash, you can restore multiple pages at the same time. Locate the right hand panel and click on the Trash link, located at the top of the page list. Now you will see a list of all the pages in the Trash. Next to each page is a checkbox. Check the box for each page you want to restore. Click on the Bulk Actions dropdown and select Restore. Click on the Apply button to restore the pages to your site.